The most obvious, most recent and most well-known example of the way in which these three issues intersect is the so-called ‘global gag rule’ imposed by Donald Trump which blocks US funds to any organisation involved in abortion care and advice. Ruth explained that while this has been the kneejerk policy reinstatement of every Republican president since Reagan, Trump’s order goes further and applies to any healthcare organisation in receipt of US Aid, not just family planning organisations. Speaker after speaker outlined the way in which the aid and development agenda has been skewed by a new world order shaped by the rise of religious forces. According to Ruth, the reason why there has been no further UN conference since Beijing 1995 is because progress in universal human rights and reproductive rights for women could no longer be relied on in the post-cold war world with the dissolution of the Soviet Bloc and its commitment to secularism. The shrinking of the state under neo-liberalism in many parts of the world combined with austerity budgets and reduced welfare spending has left it wide open for FBOs (faith based organisations) to take over services, many of which are delivered to women in need. Ruth cited a WHO report which estimated that 40% of health services in Sub-Saharan Africa are provided by the faith-based sector and between 30 to 70% of health sector infrastructure there is owned by FBOs. Afaf Jabiri, Senior Lecturer at the School of Social Sciences, UEL, pointed out that in Jordan, shelters for women are run by the women’s wing of the Islamic front which refuse to admit women escaping sexual violence as they are seen to be ‘immoral’ women who were in some way complicit in the crime. In Pakistan, local religious actors have been flexing their muscles on a range of issues such as education for girls and reproductive rights for women; the development paradigm there has been affected by Talibanisation. 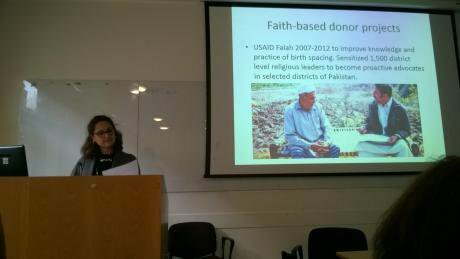 Ayesha Khan, who works with the Collective for Social Science Research in Karachi, reported that ‘There is a new interest in faith based programming, new support for informal justice mechanisms and sidelining of rights based discourse. Aid agencies are shrinking their vision of the achievable.’ USAID spent time and money trying to win over local mullahs to support their campaign for increased contraceptive uptake although there is no empirical evidence to suggest that this strategy might work. In fact, family planning is one area where there is a convergence of views between the Taliban and mainstream political parties. Militants believe that family planning is a cover for a conspiracy to reduce the Muslim population. Their slogan, ‘barra khandan, jihad asaan ’ i.e. bigger families makes jihad easier, is hardly like to be a good fit with women’s reproductive rights. The power of local religious actors to impact the women’s rights agenda is very clearly visible in the impact that the Pakistani Taliban has had on the delivery of primary health services in the border areas contiguous with Afghanistan. The women who worked in the Lady Health Workers programme, partly funded by external aid agencies, delivering vaccinations, ante-natal screenings, nutrition counselling and contraceptives were discredited for the crime of leaving their homes to carry out their duties and earning money. Many stopped going to work when the Taliban decreed that they should be punished by sexual assault or death. The post 9/11 punitive atmosphere fomented by the War on Terror initiatives across the world has also encouraged a counter movement of engaging enthusiastically with faith based organisations (FBOs), or rowing back on women’s rights in a placatory measure. A commander of the Britsh Metropolitan police complained that police work on forced marriage was being hampered by the British government’s desire to keep religious leaders onside in the bigger fight against extremism. In Pakistan, the government trades women’s rights in exchange for the integration of its religiously conservative tribal areas into the political system of the country. Ayesha described government moves to legalise the jirga, or tribal council, used in conflict resolution, a move opposed by women’s groups. A range of international donor agencies, including DFID and the World Bank are funding capacity building and training for jirga members despite the fact that their record of delivering justice to women stands on shaky grounds. In the UK too, cuts in legal aid have been partly responsible for increased uptake of parallel legal systems like the sharia councils. In many of the war zones, political power has been gained at gunpoint by religious leaders and ensured their inclusion in peace settlements. 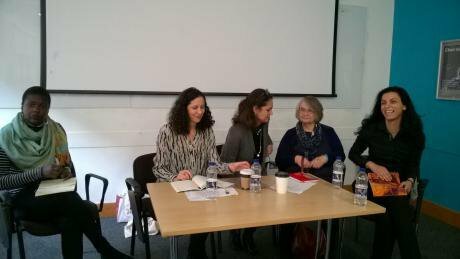 Syria is a prime example of this where women’s presence in the peace negotiations is negligible even though research quoted by Valerie Amos, Director of SOAS, showed that the presence of women increased the prospect of lasting peace by 20 per cent. Whilst Valerie made a passionate case for the importance of the law in challenging gender discrimination, Ayesha showed how the law itself could be bypassed by the alternative dispute resolution system in Pakistan and Afaf explained how there was a deliberate blurring between laws and fatwas in Jordan as a way of bringing religious discourse into the mainstream. NGOs in Jordan have been campaigning for legislation to criminalise honour killings and to end the practice of forcing women to marry their rapists. Instead of passing laws, the Fatwa department issued fatwas to that effect, a move that was welcomed by UN Women as well as Jordanian feminists who had not taken fatwas seriously to date. International aid agencies have enforced new ways of networking for change: a DFID initiative to deal with domestic violence in Jordan expected NGOs to strategize together with ‘moderate’ religious leaders of different faiths. Afaf pointed to the irony of the easy alliance struck up between Muslim and Christian leaders against women’s rights. At the meeting between Jordan and CEDAW (Committee on the Elimination of Discrimination against Women), Jordan was represented by two sharia judges, among others, despite the fact that it prides itself on its modernity. Afaf reported that CEDAW told the NGOs that now was not the right time to raise the issue of women’s rights in Jordan because it had enough on its plate with containing refugees and fundamentalism. In the past the NGOs would have been outraged but it is a sign of the extent to which they have co-opted. The unwillingness or inability of development agencies to understand the dangers of religious forces, moderate or otherwise, is one issue. There is also the issue of how fundamentalism is framed. Afaf referenced Edward Said’s notion of ‘imperial continuity’ in relation to the notion of fundamentalism and to whom it should apply, while referring to the furore over the ESCWA (Economic and Social Commission for Western Asia) report which documented religious fundamentalism within the settler colonial state of Israel. Rima Khalaf, Head of ESCWA, resigned in protest at being asked by the UNSG to withdraw the report because it labelled Israel an apartheid state. Afaf questioned the hypocrisy of international organisations which do not challenge Jewish claims to land promised by God while condemning ISIS for its claim to land in Syria and Iraq on the same grounds. It seems as if the ambitions on paper expressed in the Sustainable Development Goals of the UN, particularly SDG 5 which deals with gender equality, will continue to stand in inverse proportion to their likelihood of being achieved on the ground unless we are prepared to challenge religious forces which are implacably opposed to women’s rights.